Afraid of living in your parent’s basement until your 35? Good. You should be. What’d you spend all that money on going to school for if you don’t land a great job at the end of those four years? Okay, enough of the scare tactics. You’re smart, successful, ambitious, and full of drive, who wouldn’t want to hire you? Unfortunately, as you look around at graduation, you’re in a room full of people who are just like you. So how can you stand out? One area that your parents probably can’t give you advice on is social media. When your dad got his first job no one was scouring through 2,000 tweets from freshman year of high school. When it comes to social media you want to make sure you are leaving the best version of yourself out there for a potential employer to discover. The rule of thumb: If you wouldn’t show your mom a post then you should delete it. No employer (or mom for that matter) wants to see 40 photos of you with a red solo cup. Have some tweets out there that would cause a stir at the dinner table? Best to delete those, too. Only follow Barstool and Meme accounts? Try unfollowing them while you’re on the hunt. You’re only as clean as the content you keep. Thinking of just locking everything up and making it private? Sure, you can do that, but what’s at risk? According to a study done by CareerBuilder, having a presence on social media matters. 44% of hiring managers stated that they found content on potential employees accounts that caused them to hire that person. Make your social accounts work for you and not against you. Cleaning up isn’t only done on your cell phone. Your mom might not be there to make sure your dress shirts are ironed for the big day, but guess who is? A dry cleaner! Drop off your interview outfit to the nearest dry cleaner and let the professionals take over. A clean suit or skirt with a freshly ironed shirt will make you feel and look your best. No car? No problem. Thanks to companies like Bonobos wrinkle-free shirts are now a thing that exists. Keep one of those in your closet for when a recruiter is looking to do a follow-up interview and you don’t have a way to get to the dry cleaner! Now that we’ve got the outfit covered, let’s talk face. When it comes to makeup, it’s best to keep it bright and fresh-faced. You want a recruiter to remember you and your face so when they head back to LinkedIn and look you up, your face pops right out at them! The same thing goes for the guys. Stop hiding behind the beard and let your face shine. 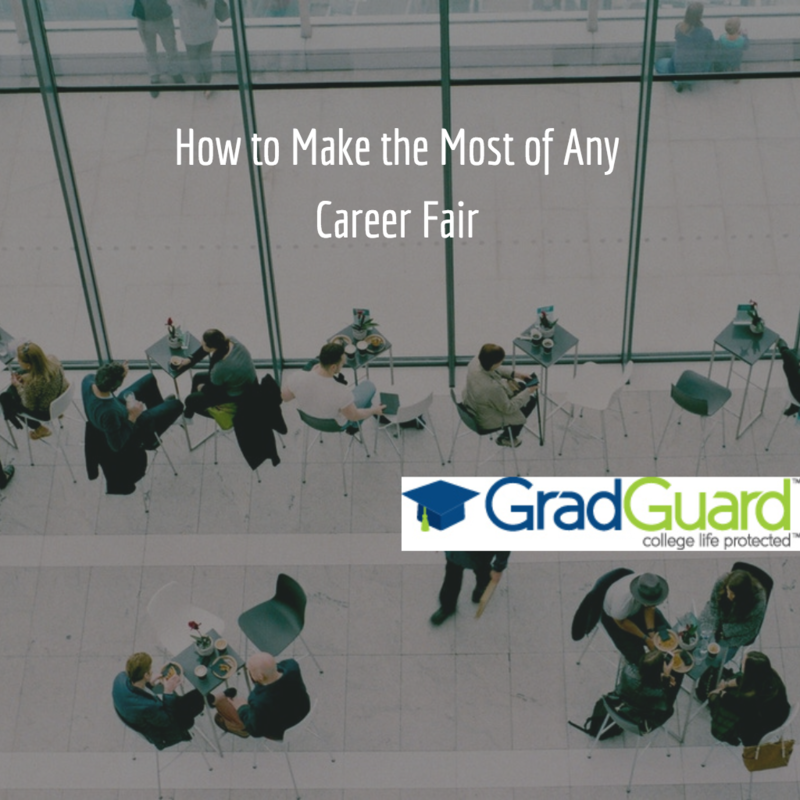 Hoping to get a bunch of interviews lined up post-career fair? Invest in a razor subscription service like Harry’s to make sure you always have the tools on hand to clean up your look before meeting with an employer. While beards are much more accepted in the workplace now, it’s still good to let recruiters get a good sense of your face so they can recall it later when reading your resume. As much as you’re trying to impress your future employer, they’re also trying to impress you. Every business is interested in finding the best talent, and that means you! Remember that you have leverage in this situation as well, and you shouldn’t be afraid to use it. A great way to stand out from your peers is to have some prepared questions that are really out of the box and will cause a recruiter to think before answering. Sure you can ask what the day to day is like, but why not dig deeper? Find out what kind of interaction leadership has with entry-level employees. Is there continued education? What systems are in place for innovation and bringing new ideas to the forefront? Doing your research before walking in the door can make a world of difference when it comes to first impressions. Don’t walk away from a table until you feel you have a true understanding of the job and if you would be a good fit for it. So much of landing a job is about how you fit into a company and their culture, and a recruiter will only respect you more for understanding that and challenging the status quo. If you’ve managed to stand out from the crowd already, you’re 90% of the way there. Closeout strong by having a leave behind that will make a lasting memory on any future employer. Sure having your resume on hand is great, but how can you take it one step further? Whether it’s a digital resume, a pencil printed with your name and email, or a 3D printed business card, having something for a recruiter to take home with them that won’t get lost in a folder is a huge win. Not the creative type? Keep it old school and send a handwritten thank you card the next day. Trust me, showing that you figured out how to buy stamps will impress any employer. Make sure to cater your note specifically to that recruiter and position so you can show your attention to detail and great listening skills. Now that you’re basically ready to land a VP job at Google, get out there and make some connections! When it all boils down to it, the best way to stand out is by being the very best version of yourself.